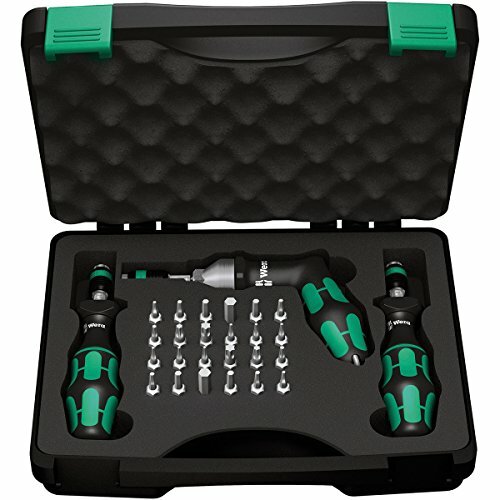 Wera torque screwdriver set. Two high precision torque screwdrivers with variable torque settings. One torque screwdriver with Kraftform pistol handle for the transfer of especially high torque; multi-component for high working speeds and particularly ergonomic screwdriving. Simple adjustment of the required torque value without any special tools. Easy-to-read scale value. Rapidaptor quick-release technology for rapid bit change. Unlimited torque to loosen seized screws. Multi-component Kraftform handle with hard and soft zones for high working speeds, whilst being easy on the hand. Includes a bit assortment in a High quality and stable plastic case.